The original nondescript bag was a perfect target for thieves. Thieves who stalk airport luggage carousels usually prefer nondescript bags. Then, if they’re caught, they can always claim they simply mistook the stolen items for their own property. Now silver shoe paint highlights the vinyl edging. Beads of silver fabric puff-paint outline stitching and form a compass design on the front. 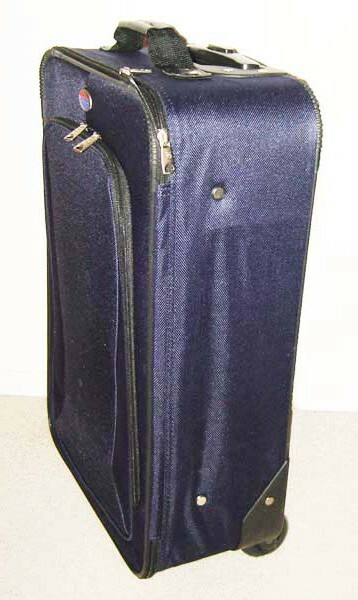 One solution is to choose distinctive, memorable luggage. If you’re not eager to buy new bags in purple plaid or zebra designs, your options include using brightly colored straps, tying jazzy ribbons on the handles, or even spraying swaths of paint across the front and back of suitcases. Not only are crooks less likely to grab such bags, but you’ll also be able to supply a better description to airline personnel in the event your luggage goes missing. 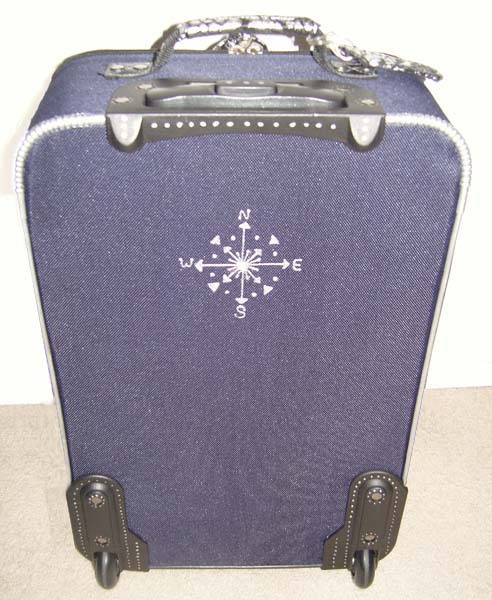 A matching, slightly larger compass design on the fabric back ensures easy identification if the bag lands face-down down on a luggage carousel. While I’m all in favor of preventing theft, I draw the line at toting garish suitcases. 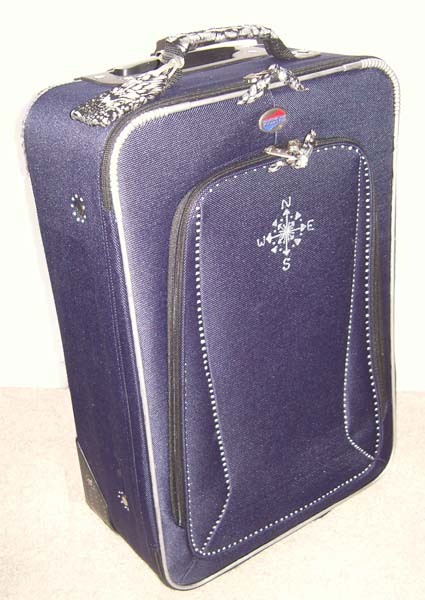 So, when my mom downsized this year and let me have her set of navy blue American Tourister luggage, I wondered how I could transform the set into something distinctive, yet elegant. 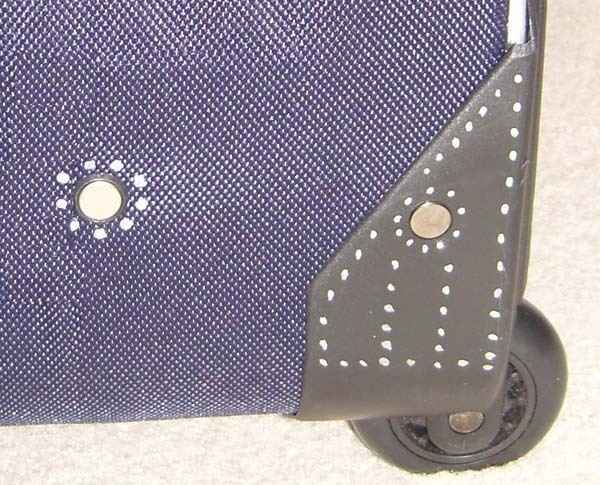 I kept in mind that any personalization had to allow me to identify the bags quickly on luggage carousels no matter how they landed—face up, face down, or sideways. I wanted to avoid straps that might catch on protrusions, and whatever I used for decoration had to stand up to the wear and tear of travel. Silver paint whimsically decorates hard plastic areas and turns grommets into flowers. An inventory of my craft supplies revealed a container of silver shoe-and-handbag paint, along with a bottle of silver fabric-writing puff paint. I wondered, would a delicate tracing of dots produce the look I wanted? An online search for henna designs found a compass pattern that seemed perfect as a travel motif. 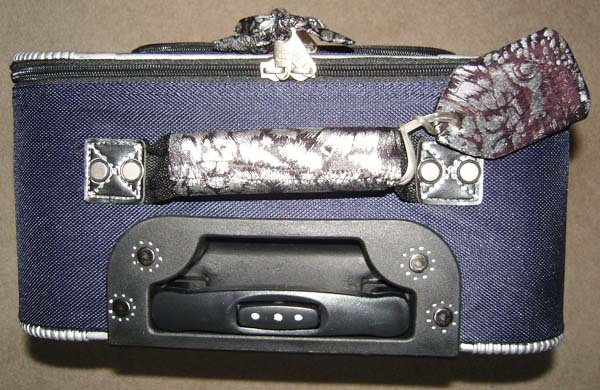 The final touch was using black-and-silver fabric scraps to cover the handles and luggage tags and to make zipper ties. The goal is uniqueness, not necessarily perfection. I’m confident that these enhancements will help ensure that I and my luggage will always be reunited, no matter in what compass direction we travel. This entry was posted in Décor on a Dime, Pennywise Packing Pointers, Uncategorized and tagged airports, bags, carryon, crafts, creative solutions, decoration, fabric paint, luggage, luggage carousel, straps, suitcases. Bookmark the permalink.